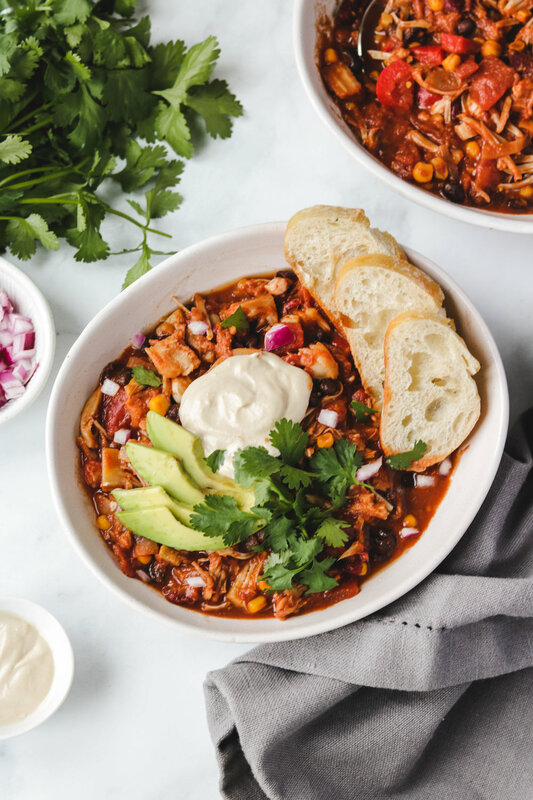 This Pulled Jackfruit Chili will have you PULLIN’ on your taste buds! So much flavour and spice making it the perfect meal for a cold chilly night. Made in just one pot and the left overs can be packed in the fridge or freezer for an easy meal prep! Vegan + Gluten & Oil Free. It’s about time I share a chili recipe! Eric (my boyfriend) and I LOVE making chili. It’s quick, easy, warming, comforting and always hits the spot. Every time we make chili, we never measure anything and use a variety of ingredients but we always use the same base of ingredients: onions, garlic, fire roasted tomatoes, 2 kinds of beans, corn and spices. If you’ve never tried cocoa powder in your chili, I promise it doesn’t end up tasting like chocolate! It gives the chili more depth and heightens the rest of the spices. 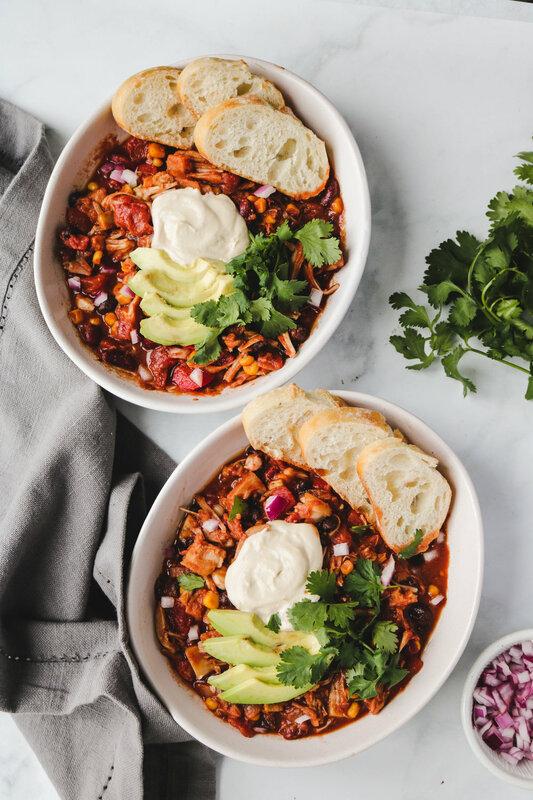 This chili is protein packed, but the addition of the jackfruit gives it a meaty appearance and texture (perfect for non-vegans!). Jackfruit is seriously is such a magical ingredient. I’ve made pulled bbq jackfruit, jackfruit sliders, jackfruit tacos and whats great about it is that it doesn’t taste like anything so it just takes in all the flavours you season it with! If you’ve never tried jackfruit before, I highly recommend you do- it’s a game changer! & makes for such a comforting warming meal! When purchasing jackfruit, be sure to buy the one that is called YOUNG JACKFRUIT in BRINE and not syrup. Canned young jackfruit can be found in the canned fruit section. As you’re cooking the chili, it might seem like too much liquid at first but it will reduce! If you do like your chili more “soupy” then feel free to add more liquid- but I would recommend doing this after you’ve finished simmering. If you do add more liquid, be sure to adjust the taste by adding in more spices, cocoa powder, salt, pepper and sugar. 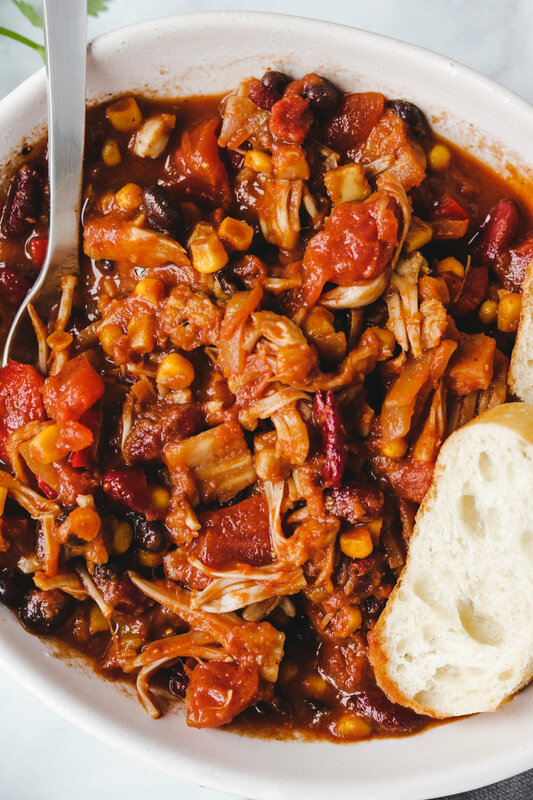 Pulled jackfruit chili will last in the fridge for up to 5 days. If placing in the freezer, divide them into 4-6 containers and allow to freeze as is. Defrosting can be done in the microwave or on the stove for around 5 minutes. 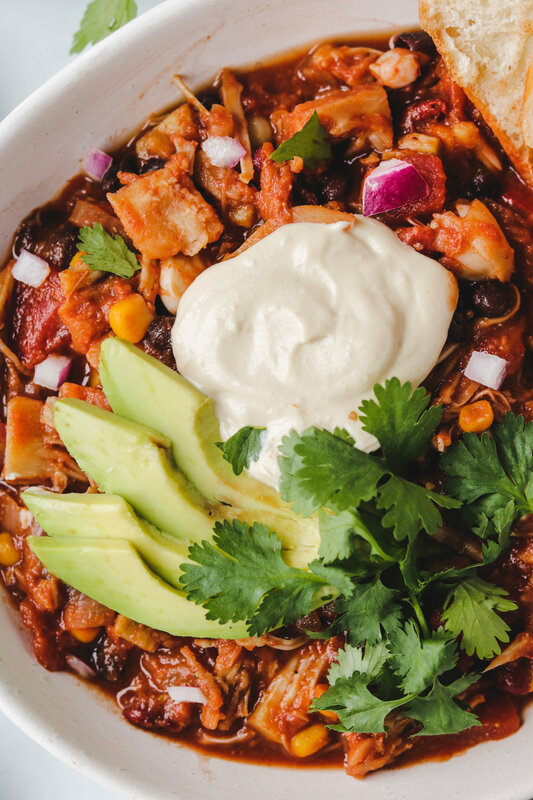 If you recreate this Pulled Jackfruit Chili please share it and let me know what you think by tagging me on Instagram @lisakitahara, I love seeing all of your tasty recreations! Garnishes: cilantro, lime & avo, cashew cream. Over medium high heat, into a large pot add in the sliced onions, mashed roasted garlic and jackfruit. Start pulling the jackfruit with two forks and sautéing them until the onions and jackfruit start to brown (4 mins). Add in the bell pepper, tomato paste, spices, cocoa powder and sauté for 2 more minutes. Add in the black beans, red kidney beans, corn, diced tomatoes, coconut sugar, salt and water. Allow it to come to a boil and then bring down the heat to low and allow it to simmer covered for 10 minutes, stirring occasionally. Garnish with cilantro, green onions, avocado, garlic aioli or sour cream and enjoy!